I read one source years ago suggesting that the primary control mechanism of bison was the human population on this continent, as many as eighteen million at the arrival of the Europeans. Thus followed a human die-off, and the bison population exploded. Migrating settlers were confronted with millions upon millions of the beasts. The slaughter of that era had two purposes – to open range for cattle, and deprive natives of their primary food source. Both succeeded. In the real power structure, the Montana Stockgrowers Association is the group that makes and enforces policy regarding bison in Montana. The Montana Department of Livestock holds titular authority, and underneath that is the governor, charged with grabbing a baton and leading the parade after it is moving. In the early 1990’s, the Governor or Montana was Stan Stephens, and during his administration Montana became a nationwide laughing stock. The Yellowstone bison herd had overgrown and had to be culled. To do so, Stockgrowers invited a public harvest. The nation was shown images of “hunters” dressed in hunting garb standing fifty feet away from their trucks and prey and dropping them. It was disgusting to watch. The next governor, Marc Racicot, had better advice. He built a wall, and did the slaughter away from cameras. No images, no outcry, no problem. I was a writer for Writers in the West at that time, and reacting to the buffoons masquerading as hunters, wrote a column describing the cat-and-mouse game played by Racicot. I was ego-boosted when a friend of my daughter’s, in school in Wisconsin, said my WITW piece was a subject of discussion in one of her classes. At issue are brucellosis, wolves, the real power structure, and the real effect of absence of apex predator on the landscape. Once it was humans. Now we rely on wolves and grizzly bears. Brucellosis is a disease that causes abortion in elk and bison, and undulant fever in humans. It is under control in our cattle population, but the mere threat of species transmigration is enough to affect markets and cause quarantine. So the Stockgrowers watch it closely. Even the perception of threat to cattle will cause them to bring out the big guns. I get this, and given the unbridled power of the MSA, not much can be done to stop them. 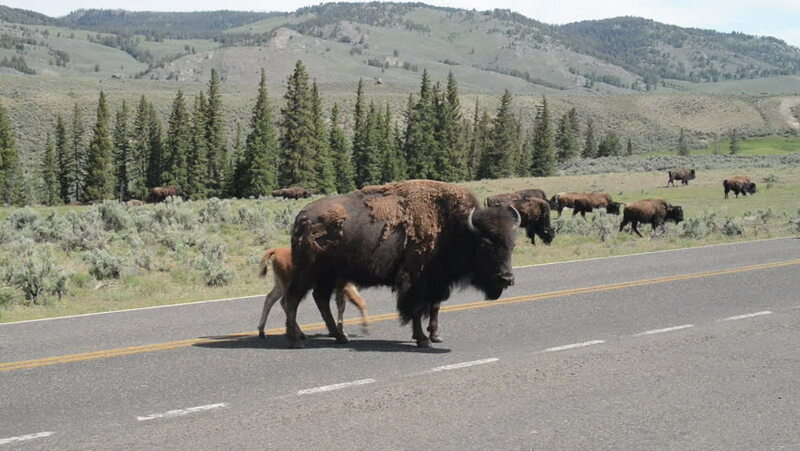 There is not enough predation in Yellowstone national park to keep the bison herd down to a reasonable number. Wolves are great hunters, grizzlies less so, but in bison they both meet their match. Wolves prefer elk, and bears the carrion created by wolves. As a result, the bison population in Yellowstone regularly gets out of hand. Three methods of control are die-offs, migration, and culling. Culling by humans is not allowed in the park. When food supply wanes, bison migrate into the greater ecosystem, and the Stockgrowers spring into action. These days, the killing is done out of sight, and the meat carted off to Native American reservations. I do not know of a better solution. The effects of bison overpopulation on the landscape are devastating. Perhaps we could invite our Native American friends in each year to enjoy a harvest, as their ancestors did. But culling is essential. There is no way around it. Nature is out of balance. Human management is essential. In my view. I invite others to set me straight. http://www.emwh.org has the most detailed story behind the “we-need-to-manage” propaganda. Let’s begin with Yellowstone National Park. The number of bison — the “target” number — is fake, made up, with no scientific foundation whatsoever. The estimated carrying capacity is roughly 6,000 bison, but without proper focus on that baseline a lot of political mischief takes over. APHIS runs the show. It’s a federal agency that funds the Montana DOL, and controls most of what goes on outside Park boundaries. Bison brucellosis cannot be transmitted to livestock due to genetic differences. This is why elk are now the target of APHIS and its underlings in Helena. Elk and livestock may interract. Bison cannot. Elk are now being hunted year-round to save livestock from inflated infection data and another hoax being driven by ranchers, Montana DOL and FWP, and APHIS. Been a while, and the word “APHIS” had left my vocabulary. But what, aside from starvation and migration, controls the bison population? There is much to comment on, in your post, so I’ll just ramble on in. First off, the MT Stockgrowers have no enforcement ability. That is where the MT. Department of Livestock (MDOL) comes in. As a state department, it has the authority to maintain an armed presence, and legally enforce laws at gunpoint — which it does regularly (I had an armed MDOL agent look over my should as I inspected MDOL bison management documents we forced them to release to viewing, in a “sunshine” court case we won against them in District Court). While I would say that the Stockgrowers, as an organization, aren’t responsible for creating policy, there is no doubt that they are the driving force in the MT Legislature, and in the MDOL for inventing policy to advance and protect their interests — not to mention helping to elect legislators. The MDOL is a most unusual state department. It is the only department that is quasi-independent in that the Governor does not appoint a department head. All the Governor can do is nominate individuals to sit on the Board of Livestock (the statutory “Director” of the MDOL) for a six year term, and the State Senate will confirm the nomination. As an example of how corrupt this process is, the last nominee to the 7-person board was Bullock’s nomination earlier this year of Nina Baucus to the Board of Livestock. Yes, Nina Baucus as in married to John Baucus (the two own the Sieben Ranch), half brother to Max Enke Baucus. The Board of Livestock hires its own Executive Officer to serve at their pleasure (and the last MDOL Executive Officer was fired not too long ago for “losing” almost $200,000). And as Steve said, MDOL is the state agency responsible for taking all the APHIS/NPS/USFS slush money to implement the various brucellosis and Bison management policies and plans. Ok, brucellosis… it is a cattle disease that was transmitted to bison through the feeding of contaminated cow’s milk to orphaned bison calves. Bison are not usually affected by brucellosis, and the incidence of any miscarriage is very rare. Most bison that have been shown to have the antibodies have only been exposed to brucellosis and don’t necessarily have the disease (like getting immunity from a vaccine). And it has never been documented that bison have transmitted the disease to cattle. So killing off of brucellosis “exposed” bison would be similar to killing off humans that show they have been exposed to say, smallpox, because they have been vaccinated. In a way, exposed, but not diseased bison may carry a genetic marker protecting them from the disease, and not being an infected carrier. The current test-and-slaughter regime may actually be working against herd immunity (maybe that’s what the cattle barons want???). So having said all that, a major problem with how the bison/brucellosis issue is framed, is that they are “Yellowstone” bison. Which is ridiculous. They are wild bison, and would move freely between the Park and surrounding habitat in Montana, Wyoming and Idaho at will, if allowed. So why is the problem framed this way? Because bison are a threat to the cattle industry hegemony over the range, i.e. to Montana Stockgrower’s Association members. So the population numbers are artificial. And the number that YNP uses is 3,000 and we have a current population of around 5,000. And the 6,000 number is just an artificial absolute cap that really freaks out APHIS and MDOL. The real problem is what is the number of wild bison needed not just to preserve it as a species, but to allow it to flourish and diversify? Wild Bison have been through several “bottleneck” events that have severely limited genetic variability, which puts them at increased risk for a single extinction event to occur (like severe weather or disease). There are many different viewpoints on what is the optimal population number and herd structures needed to protect and enhance the genetic variability and chances for the species to survive (and cattle-gene infested herds do not count in this equation). Let’s just say that the population levels and herd independencies needed are far greater than what currently exists, which is why there are petitions to list the species as threatened and endangered being worked on. Now, if we haven’t even decided what level of population is needed to protect the species in perpetuity, how can we set artificial herd boundaries and population sizes and call for management activities to maintain certain population levels in a single small population with severely restricted habitat? To me it’s a no-brainer that we can’t. So culls absolutely are the wrong population management tactic at this time. The better choice is to increase habitat and herd variabilities. Which means far greater population numbers and bison herds moving into Madison & Paradise Vallies, down the Shoshone, Wind and Green River vallies into Wyoming, up into Island Park Idaho, etc. What about Native Americans? Well, many “affiliated tribes” already have treaty rights to hunt bison in and around Yellowstone, and they can exercise that outside of state-sanctioned hunts. What really is happening is that the MDOL and Montana Stockgrowers Assoc. are using the politics of the situation to pit tribes against each other, tribes against enviers, foster intertribal problems, etc. to maintain the status quo. Sorry for the long rant, but this stuff is near and dear to me, and I’ve spent a lot of time working on the issue, going back to the original hunt-sabs around 1990. My first thought as I read was that “I don’t disagree” with anything you are writing. It may be true that MDOL has “enforcement” powers, but the nature of power is that it does not usually show up on organization charts. And I think you agree, from what you wrote. My impressions are unscientific, that the herd is overrunning LaMar right now. I cannot imagine how the landscape will survive the current population surge. But that is not scientific, so I will back burner it. Instead, I revert to my original assertion, that we lack an apex predator for them, so that we have to fulfill that role ourselves. And culling when they leave the park seems the answer. But your words … “Because bison are a threat to the cattle industry hegemony over the range, i.e. to Montana Stockgrower’s Association members” are much like my own words to Racicot in a letter wrote to him during that time, that wildlife management was just a way for landowners to extend their power into public lands, in essence, own that too. In light of my stupidity regarding Miles Mathis, I am grabbing on to that as a way of saying I ain’t that stupid. Not always, anyway. Brucellosis – I’ve long known that it doesn’t threaten cattle, but I also know that an embargo soon follows any hint that it might be around. It is not scientific, but it is the reality that cattlemen have to deal with. They ain’t all bad, but they are in a position of power, and so even though they cannot control powers above them, they can piss down on us. We ain’t that far different. Thanks for chiming in. The reason some people may think that Yellowstone is over populated is only because the MDOL hazes Montana’s bison into the Park. That’s not the way I look at it, but when people think that the only habitat is in the Park, and call the herd “Yellowstone’s bison,” and if the Park thinks there is too many, then something needs to be done… well then the cattle barons have succeeded in reframing the issue. Again, if there are too many bison inside the Park, it is because MDOL doesn’t tolerate them in Montana and continually hazes them back into the Park — it’s an artificial congregation. The problem is easily solved by ending hazing. Bison will disperse naturally, avoiding overgrazing an area. What about Miles Mathis? That seemed to come in from left field. Context? Maybe I missed the string that connected that to something above. Coffee. Mathis is in suspense right now till I get a better grip on him. I reacted too quickly to all his writings, thinking he’s just a guy with a curious mind and prolific output. But there are golden apples (as Garrison called them) all about, waiting to be discovered. Some are genuine – but this Mathis guy is a mixture of plausible (Stephen Hawking died in 1985) and absurd (JFK was fake deathed). He is incurious as can be about 911 but says that Custer’s battle at Little Big Horn was a false flag event designed to garner public support for siezure of the Black Hills, where gold had been discovered. I don’t know what to make of him. I added a few words to the post below this, and addendums do not go out via email on posts, so you probably missed it. I’ve only read Mathis’s rant on abstract expressionist art, and must say it sounds more personal than anything. Serious oversimplification IMO. Realism vs. abstraction is a non-issue if one advocates freedom to express whatever one wishes. There is good art and bad in both genres. His stories lack proper respect for the work and artists that preceded the genius he claims to be. Maybe it’s an age thing. Not the first time I’ve had this feeling about someone around that (50) age.